Colorado Slam grass pioneers, Leftover Salmon, take the outdoor stage at Pisgah Brewing Company for a bluegrass throw down on Sunday, May 26, 2013 in Black Mountain, NC on Memorial Day weekend. 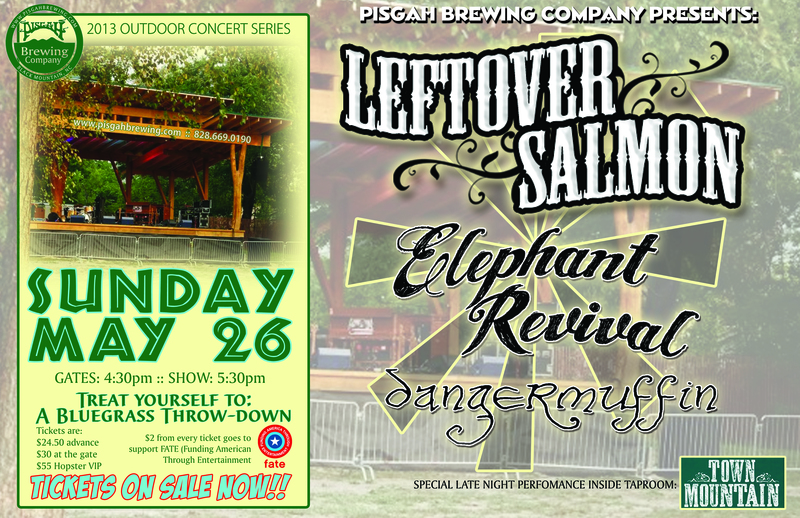 The gate opens at 4:30pm with opening performances by Elephant Revival and Dangermuffin Acoustic, and a special late night show in the taproom with Town Mountain. The show begins at 5:30pm and there will be numerous food vendors and local beer on tap. This is a one of a kind musical experience provided by one of Asheville’s finest craft breweries. The outdoor stage provides an expansive setting for this musical conglomeration. Additionally, ticket buyers will be contributing $2 of each ticket to local nonprofit, Funding America Through Entertainment (FATE), who will funnel the donations to local human service organizations. “At Pisgah Brewing Company, we pride ourselves on our community involvement and outreach. FATE gives us a vehicle to join philanthropy with our concert events,” says Benton Wharton, spokesman for Pisgah Brewery. In January 2013, Pisgah Brewing joined Town Mountain in helping generate food for 6000 meals at a FATE event. Tickets are available in advance for $24.50 and $30 day of show. A $55 Hopster VIP ticket includes early entry to the event, a private guided tour and tasting, and exclusive VIP viewing area close to stage with cash bar. Leftover Salmon is back! NPR’s Mountain Stage heralded Colorado’s Leftover Salmon as “one of the most beloved acts on America’s summer-festival circuit” as they’ve returned from an eight year hiatus touring with their new album Aquatic Hitchhiker [released May 22 on LoS Records]. Exploring new new sonic territory, AOL’s The Boot listed Aquatic Hitchhiker as one of the best Americana albums of this year. Stay tuned for new songs from LoS this summer delivered from Breckenridge Beer! They emerged on the scene in Boulder, CO in 1989 as one of the first bluegrass bands to add drums and tour rock & roll bars, helping Salmon become a pillar of the jam band scene and unwitting architects of the jam grass genre. “This is one fish that has only gotten better with age. Fiery solos and elements of country, bluegrass, jazz and jam rock combine into a heady mix of feel-good tunes — and some that carry a hefty message, as well,” said CMT in 2012. Looking back over the past 25 years of rootsy, string-based music, the impact of Leftover Salmon is impossible to deny. Today, Leftover Salmon is: Vince Herman (vocals, acoustic and electric guitar, mandolin); Drew Emmitt (vocals, mandolin, acoustic and electric guitar, mandola, fiddle); Andy Thorn (vocals, acoustic and electric banjo, National guitar); Greg Garrison (vocals, acoustic and electric bass, acoustic guitar); Jose Martinez (drums, percussion). Elephant Revival is a soulful, seductive quiver of songwriters and multi-instrumentalists that reign from points all across America. 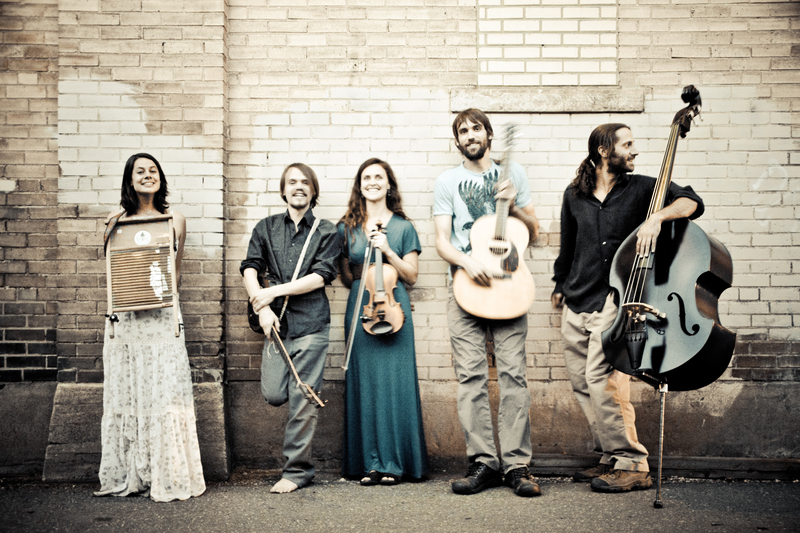 Since 2006 Daniel Rodriguez, Bonnie Paine, Dango Rose, Sage Cook and Bridget Law have herded in a greatly applauded neo-acoustic and gyptic revival at festivals, theaters, clubs and house concerts from the Pacific coast to the rolling hills of New England. Elephant Revival plays entirely original music with a few carefully chosen traditional and eclectic cover tunes but their precise genre is hard to pin down. 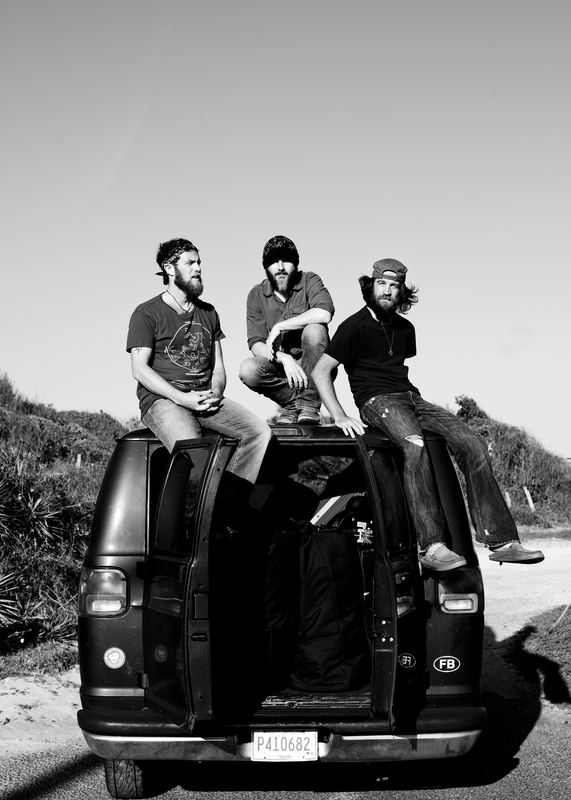 On Dangermuffin’s 2010 release Moonscapes, the Folly Beach, S.C. based trio sang about home. Even they couldn’t have expected the extent of that paradox the album grew the band into a traveling national act, with songs on both SiriusXM’s Jam On, Outlaw Country stations, and slots at major festivals across the country. With the release of their latest album in 2012, Olly Oxen Free, Dangermuffin have returned home. No longer easily dubbed an Americana or roots-rock band, the group’s sound encompasses ska, calypso, and even Southern rock, often within the same song. Like the cry bellowed during a children’s game of hide-and-seek, Olly Oxen Free signals that it’s safe to come out from our hiding spots, gather back together, and celebrate late into the evening. “Don’t let the name fool you- Dangermuffin is not another run-of-the-mill, directionless jamband. Rather, it’s a trio with immense talent and potential that has gifted songwriting and playing abilities in spades. Just like many a funny named band before them- Phish, The String Cheese Incident and Umphrey’s McGee come to mind- Dangermuffin is likely to become synonymous with those fans who love bands that deliver something new and promising each show.” says Josh Baron, editor in chief of Relix Magazine. 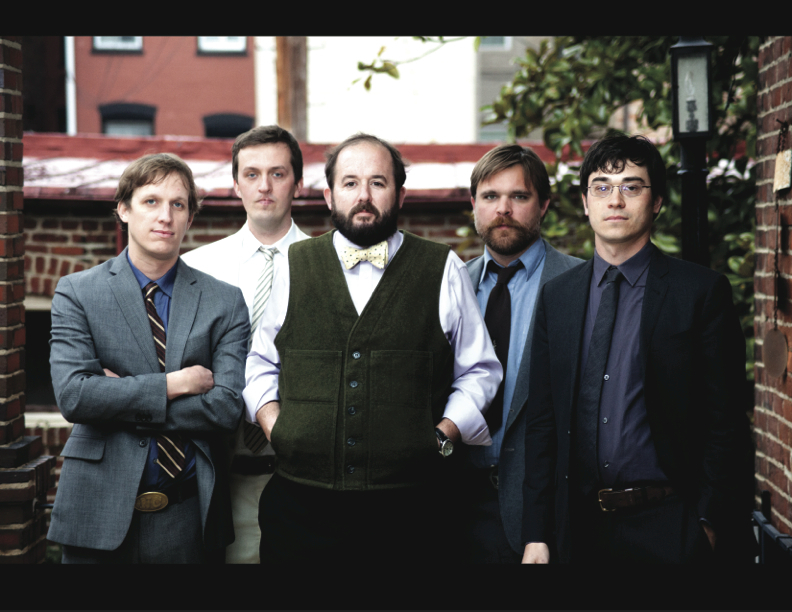 Local Asheville bluegrass brand Town Mountain released their fourth album, Leave the Bottle, in 2012. Always contributing to the evolution of the bluegrass form, they toss influence as varied as surf-rock, gospel, and honky-tonk country into their field of play. Banding together in 2005, Town Mountain is Phil Barker on mandolin and vocals, Robert Greer on lead vocals and guitar guitar, Jesse Langlais on banjo and vocals, Bobby Britt on fiddle, and newest member Jake Hopping rounds them out with his rock-solid bass. One listen to their instantly memorable songs, and it’s plain to see why Grammy-winner Mike Bub would align with the group to produce Leave the Bottle as well as 2011’s Steady Operator. Pisgah Brewing Company is located at 150 Eastside Drive in Black Mountain, N.C. For more information, visit www.pisgahbrewing.com, www.facebook.com/PisgahBrewingCo, or follow them on Twitter @PisgahBrewing.